Events are all about timing, and some, like this one run like clockwork, literally. 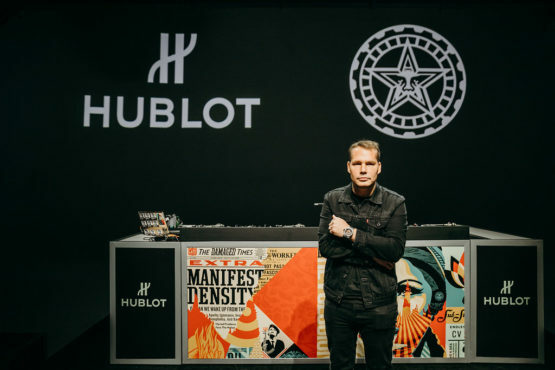 The event was the unveiling of an exclusive timepiece, the result of a collaboration between luxury Swiss watchmaker Hublot and American contemporary street artist Shepard Fairey. 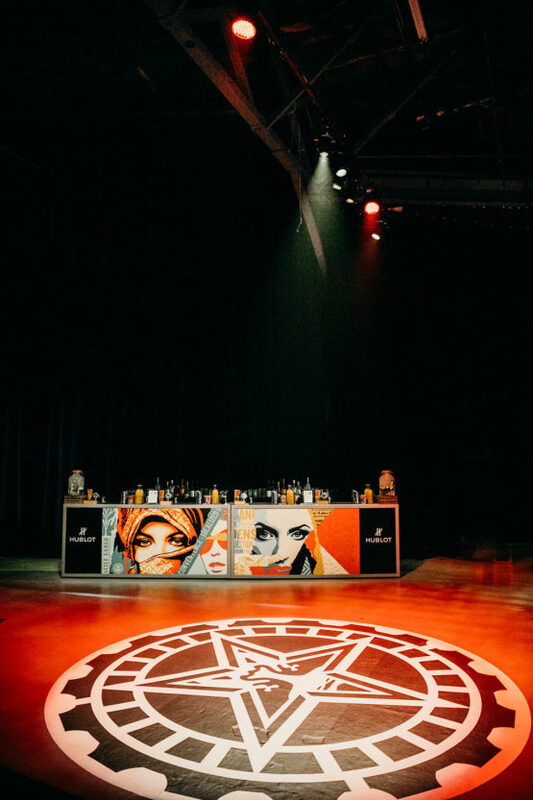 The announcement of the timepiece, titled the Big Bang Meca-10 Shepard Fairey, was produced by RG Live Events. 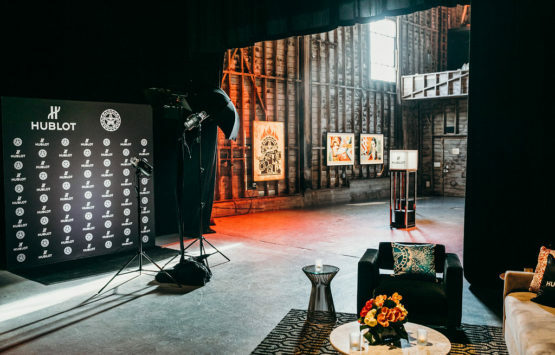 The setting for this ultra-cool event was the equally cool space, the Mack Sennett Studios. Founded in 1916, it’s one of the oldest surviving film studios in Los Angeles. 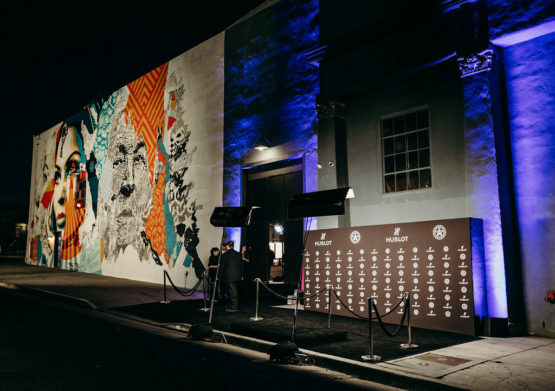 And another notable reason it was chosen – the studio’s façade features a huge mural entitled, “American Dreamers” which was painted by Shepard Fairey and fellow artist Vhils in 2018. After posing at a step-and-repeat next to this mural, guests entered a “gallery” room. At sunset, when the event began, natural light poured in through high windows on the rustic exposed walls where more of Fairey’s art work was hung. 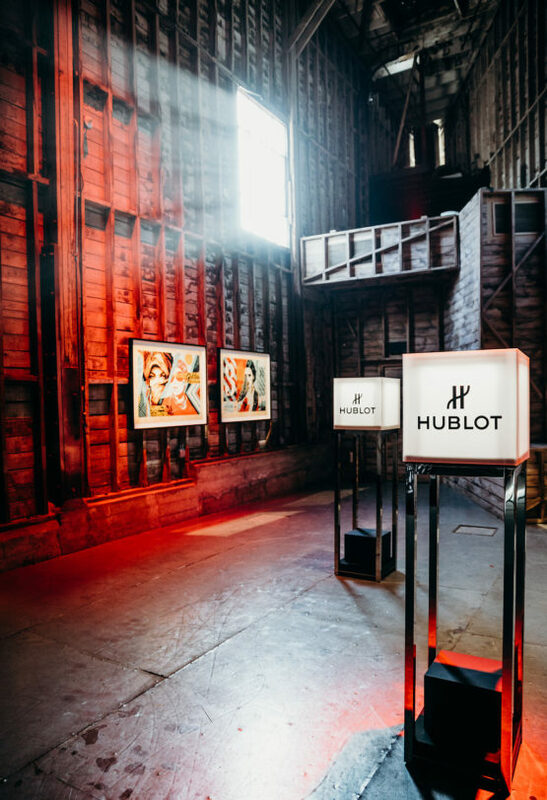 In the middle of the room, several modern, illuminated display cases held the watches for viewing. Our lighting designer Lonnie Thompson worked with RG Live Events to seamlessly blend all of the elements of the evening through lighting. As the evening grew darker, red light washed the walls. The light in the main room had grown deeper in the same red hue as guests began to gravitate there. 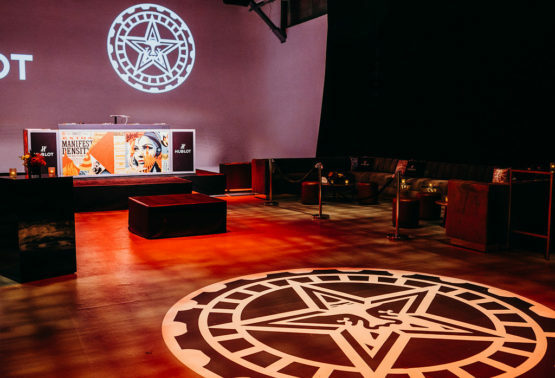 RG Live’s design of the event included a large replica of Fairey’s Obey Giant graphic in the center of the floor, a main bar and a stage custom designed with his work. Both the bar and stage were lighted by Images by Lighting. 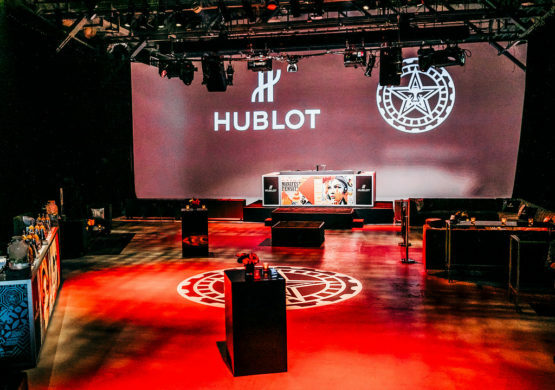 The floor was textured with lighted gobo patterns and the walls, washed in deep red light, were punctuated with projections of more of the artist’s work. During the event, guests enjoyed street food, interactive entertainment and a DJ set by the artist himself. 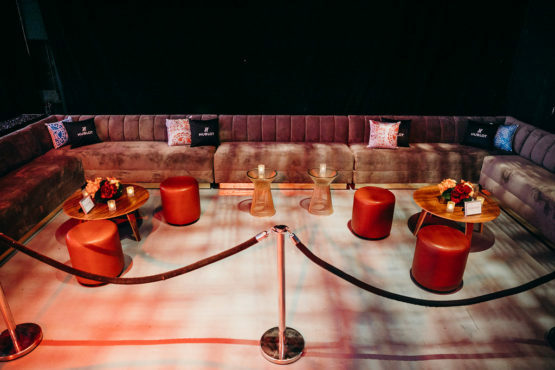 Ambient lighting continued to blend with the main stage projections produced by David Meek of CBC Clearwave and those throughout the room and in a VIP lounge area. The event ran like a Swiss watch, yet, like this particular timepiece it launched, was hip and cool down to the last detail.